If you have the opportunity, we will be happy to accept a donation for the development of the journal. 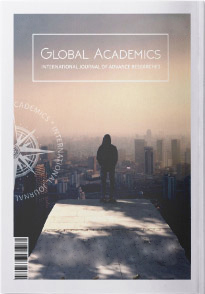 International Journal of Advance Researches “Global Academics” is a peer reviewed international journal that offers a unique platform in which to disseminate information on new concepts and on the novel application of existing concepts. Articles in this journal are welcome in the form of a research, review, short communication, commentary, etc. Authors are welcome to submit their contribution within this widely scoped periodical. The International Journal of Advance Research “Global Academics”, publishes articles that cover all aspects of innovation in different fields of knowledge. The journal includes a wide range of scholarly fields creating a platform for authors to make their academic contributions. Submittal to the journal includes a peer review process through the editorial office for all submitted manuscripts so as to insure the quality of this publication. The journal is founded by the non-profit public organization World War III Prevention Project, Corp., located in Jacksonville, Florida, USA. Our goal is to find and define theoretical and technological designs in various fields of knowledge in a search for qualitatively new solutions of modern global and local problems - thus achieving a new quality of modern civilization. In this regard, the journal's editorial policy is aimed at the scientific search for solutions to current problems, as well as the systematization of diverse academic research and the defining of priorities and principles which will allow for approaches to system analysis of these current problems and their integrated solutions. In this context, the plan is to divide the publication into research areas, organize published academic articles and research into online conferences and roundtables which will include organized live conferences and roundtables on the most relevant subjects, and the establishment of ongoing international research groups and committed sections of this publication on the most prospective directions for continued research. © 2019 Global Academics - Open Access Publisher.